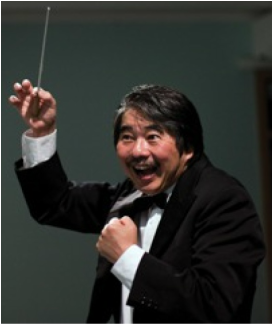 The Sea to Sky Wind Ensemble is a 50+ piece wind symphony led by our Music Director, Tak Maeda. The Ensemble grew out of the former North Vancouver Alumni Band. 2015-2016 is our 29th season. ​We rehearse weekly at Windsor Secondary School in North Vancouver, at the west end of the school (off of Lytton Street). Our rehearsals are Tuesday evenings: set up at 7:55 pm for prompt rehearsal start at 8:05 pm until 9:30 pm (during the regular school year). ​A graduate of the Osaka College of Music and an overseas student of Frank Kaderabek (former principal trumpet, Philadelphia Orchestra), Takuya Maeda joined The Kansai Philharmonic Orchestra, a full time professional orchestra in Osaka, and performed with them from 1979 to 1989. In addition, he was a Band Clinician for Yamaha Music Foundation Japan for many years, where he conducted mass honour bands at Yamaha sponsored clinics and festivals. It was here that he began to mentor younger band instructors. In 1990 he and his family moved to Canada. He played trumpet with the Pacific Symphonic Wind Ensemble, and was the Choir Director of the Mount Olivet Lutheran Church, as well as Bandmaster of the North Vancouver Youth Band (2002/03). Not content to sit still, Tak is also the current Conductor of the West Vancouver Concert Band, West Vancouver Adult Pops Band, and the Suncoast Concert Band. Tak is a bundle of energy in his trademark Hawaiian shirts, and the SSWE is lucky to have him!